The Programs list contains all the applications registered and controlled by Windows 10 Firewall Control. The list displays names of the registered programs, the programs running state, the allowed/blocked statistics of the programs network access and the network security zones (the network permissions) set to the programs. All the operations with the listed programs are performed via the toolbar, right-clicking the list or via the hotkeys (see the right click menu for the hotkeys assistance). The programs can be inserted, deleted and/or the permissions can be edited anytime at your option. The Filter field allows displaying a subset of the programs selected by name. If a typed letters set matches a program name the selected programs are displayed automatically. Running State/Access statistics(*)(see the legend on the Programs pane). User Name (Network/Cloud Edition). If the User Name field is set in the program permissions, the program launched in the name of displayed user follows the applied zone only. Zone. Name of the security zone (network permissions) set to the program. (*) The columns information is not updated immediately. 5-10 seconds delay should be expected for the column data actualization to save the computer resources. If an unlisted program requires network access, the program network activity is detected automatically and you are shown with the Edit Application dialog. The same dialog is shown when you need to change network permissions of a program or to edit network events processing parameters. 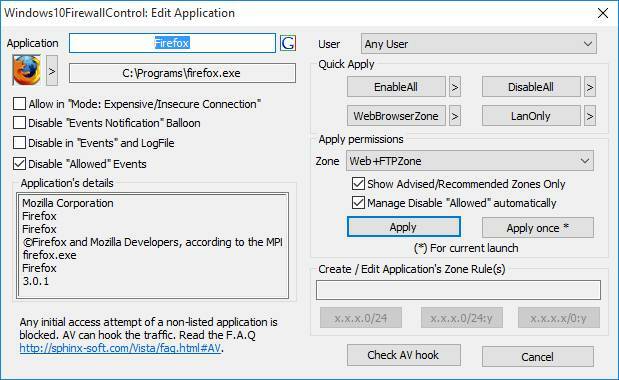 The Edit Application dialog is intended to set/change network permissions by choosing the proper security zone generally. A security zone can be applied to a program by choosing a zone from the list of available zones. The zone determines a set of rules to control the program network access. A zone can be chosen by name. The zones names are clear intuitively and reflect the zones purpose. Zones can enable a program network access in full, disable a program at all, or set partial permissions to the program. I.e. the program can access selected sites/destinations without a hassle and can be blocked accessing all the other destinations simultaneously. For instance, the EnableAll zone enables the network access completely, the DisableAll zone disables any kind of network access, the LanOnly zone enables the program to connect to any computer of your home/office network, but disables any worldwide connectivity. The WebBrowser zone allows accessing web servers only and prohibits any other types of connections. The EmailZone allows connection to mail servers only and so any other network activity with the zone will be impossible. There is a set of 30+ predefined zones (Plus Edition), so you can implement any kind of security policy almost with a single click reflecting your security needs. You can modify zones or create a new zone, if it's required (Plus Edition). Choosing the proper zone is simple enough. There are no special skills required for that. If you trust a program, realize the need of the program network activity, you should choose a permissive zone, EnableAll for instance. 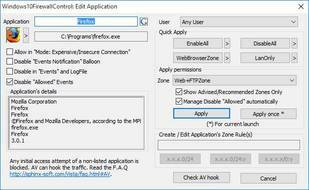 If a program that requires a network activity is not known to you, you have a doubt regarding the need of the network access, you should use a limiting zone, DisableAll, for instance. The Zone Adviser (Plus Edition) offers the most reasonable zone from the reach zones set for the application automatically when the application is detected/listed for the first time. You can just confirm the advised zone or cancel the detection prompt (the Edit Program dialog) choosing the default zone for the program. The default zone is DisableAll after the installation, so you will never miss an unwanted network activity. Instant network events notifications, detailed logging and the Events pane assist you to verify the permissions correctness and help to reconsider the applied permissions if a program is over blocked or over allowed accidentally. Any firewall is as good as the permissions used. 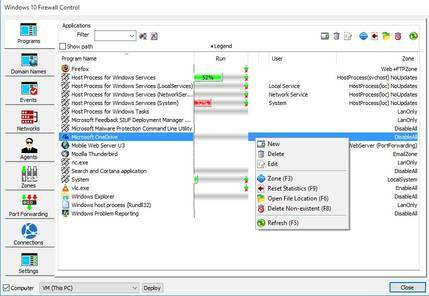 Windows 10 Firewall Control offers you the most reach set of the options and the diagnostic instruments. Application name. The name can be edited for already listed programs. The Application icon allows you changing the program icon in the Programs List by clicking the arrow button next to the current application's icon. The User field applies the security zone to the program launched in the name of a selected user only (Network/Cloud Edition). Quick Apply. The four customizable buttons allows choosing the "most popular" security zone to be applied with a single click. Clicking the arrow next to the button allows reassigning the button to apply a different zone. The Zone box lists all the available zones from the Zones repository (the Zones pane). "Show advised/recommended zones only" limits the list with the set of the most usable zones. Otherwise, the zone choice may be not easy, the list of predefined zones is long typically (Plus Edition). The Free Edition offers the four predefined zones only: EnableAll, DisableAll, OutgoingOnly and IncomingOnly. "Show Advised/Recommended Zones Only" option state is not saved within the Edit Application dialog simplifying your choice in the short list of Advised/Recommended zones only. Please use the Settings pane to make the option default. "Apply" applies a chosen zone to the program and closes the dialog. "Apply Once" applies the same zone for current program launch. About 20 seconds after the program is exited/terminated, the program entry will be removed from the Programs list automatically. "Allow in Mode: Expensive/Insecure Connection" marks the application to follow the zone set in "Mode: Expensive/Insecure Connection" (available via TrayIcon/RightClick menu). All the other (unmarked) programs will be restricted with the network access when the mode is set (TrayIcon/RightClick/Mode:Expensive-Insecure Connection). "Disable 'Events Notifications' Balloon" suppresses displaying the events notification balloon for the current program. The option is useful if there is a program with dominating network activity and you would like to ignore the program related notifications. "Disable in 'Events' and LogFile" suppresses the program related events from saving to the Log File and from listing in the Events pane. "Disable 'Allowed' Events" allows skipping allowed events in the Notification Balloon, Log File and the Events pane. The option is useful for widely enabled programs with high network activity. Without the option set some active programs may dominate and make the events analysis excessively complex. "Manage Disable 'Allowed' automatically" suggests you the most preferable state of the option above automatically. The suggestion is made using the applied zone type. "Create specific rule" inserts a specific rule to the chosen zone for the application. Clicking a button from the buttons set opens the Zone Editor with the new rule added to the existing rules set (Plus Edition). The new rule is generated basing on the detected network activity, thus the option is available on the initial program detection. The rule helps to apply the chosen zone but to make the detected related exception additionally. So you can apply the LanOnly zone (for instance) but make a permissive exception for a worldwide access or vice versa. Choosing "x.x.x.0/24","x.x.x.0/24:y","x.x.x.x/0:y" you can vary the rule IP, IP-range or the port usage. "x.x.x.x" and "y" will be substituted reflecting the network access attempt parameters. "Check AV hooks" detects presence of online antivirus monitoring (if any). The monitoring shifts the expectations of the traffic path typically. See F.A.Q. for the details. "Check AV hook" allows checking for whether the programs running on the PC are hooked by an antivirus (AV) online monitoring. AVs hook the traffic for the processing "inside" the PC while monitoring the programs on-the-fly. The real traffic can be redirected to localhost (127.0.0.1) instead of the real destination implicitly. The traffic is processed by the AV locally and then the traffic is issued to real destination in the name of the AV related service. So, programs may request a connection to localhost instead of a real public internet address. Localhost is enabled by many predefined zones typically as the localhost communication is vital for many applications and safe almost anytime. Applications permitted to communicate with localhost and not permitted worldwide actually are able to connect to any address as the result of the hook. If the traffic is hooked by AV the permissions have to be set accordingly or the AV online monitoring has to be switched off. Windows 10 Firewall Control is able to control other in-LAN/Network computers with Windows 10 Firewall Control installations remotely. You can select a computer to control from the drop box at the bottom of the user interface. The list is populated automatically auto discovering the other network connected computers with the product installed. The discovery is based on the native Windows neighbors discovery. The Network discovery must not be disabled in Control Panel/Network and Sharing Center/Advanced Sharing Settings. Choosing a computer from the list you switch to control the selected computer. 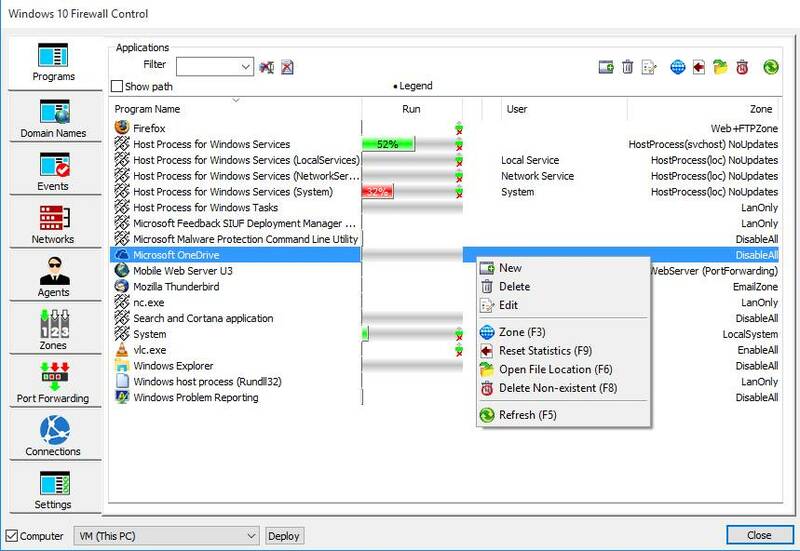 So, the option allows viewing/changing programs network permissions, detect new applications, review the Events and Connections, edit the Zones list of the product installation on a remote computer. All the remote management operations are performed with DCOM (distributed COM). Windows 10 Firewall Control creates a special dedicated user account automatically. All the remote operations are performed using this account exclusively. Since Windows is solely responsible for account processing, all the operations are as safe as any other remote access. The account permissions can be managed by native Windows tools easily.